Sustainable consumption is all about the choices made in the marketplace around production and consumption of goods long before they present a waste management problem. At first glance, the term “sustainable consumption” may seem to refer to recycling and other efforts to reduce landfill waste. But there’s an important distinction here between waste management and consumption. To understand the difference, it’s helpful to consider how the materials and energy we consume flow through the economy. 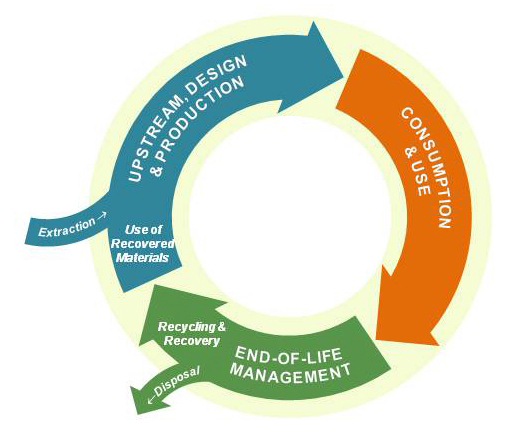 As the Materials Life Cycle diagram illustrates, the life cycle of material goods, and the energy used to produce them, includes all stages from extraction, through design and production, consumption and use and finally end-of-life management. While traditional waste management programs address the last portion of this life cycle through recycling, composting and disposal, sustainable consumption is focused “upstream,” where goods are designed, produced, purchased and put to use. It’s in these life-cycle stages that choices about material and energy inputs have the greatest impact and where we have the greatest potential for making consumption more sustainable. How do waste prevention and resource management relate to Sustainable Consumption? 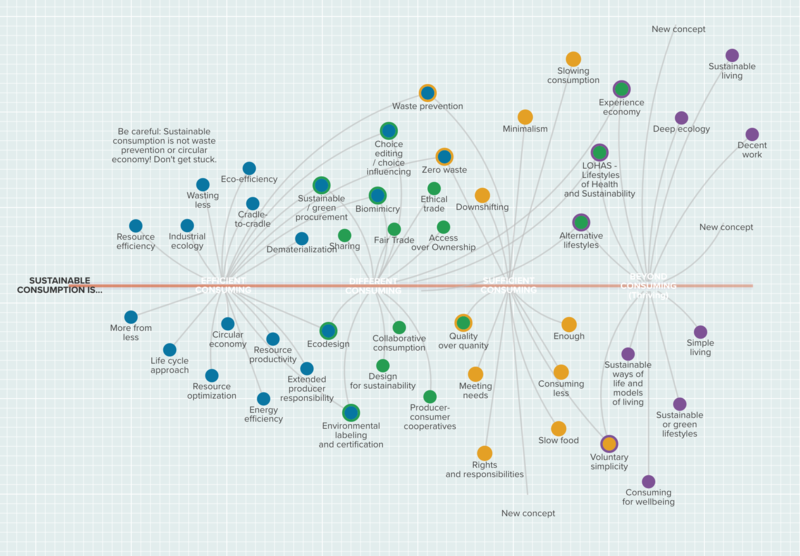 Explore the connections of these and other in this map of key Sustainable Consumption concepts. Some of the practices and solutions in this concept map may be familiar, such as zero waste, cradle-to-cradle, circular economy, biomimicry, and voluntary simplicity. This map clarifies how these and other ideas fit with our definition of “Sustainable Consumption” as a system of four interconnected approaches: consuming more efficiently, consuming differently, sufficient consuming, moving beyond consuming or thriving.